This Dutch barn style through tenon is called an Anchor beam. Here is an exploded view of the tenon and post. Sometimes it is held in with pegs only, sometimes it has wedges on the outside of the post, sometimes it has both. Could you make a video/web page and show us the tools you use and the order of cuts you make on this joint? I am especially interested to know how you bore those holes so that they are plumb through – there seem to be several gadgets and tools that do this but it’s hard to know which one is the most practical. 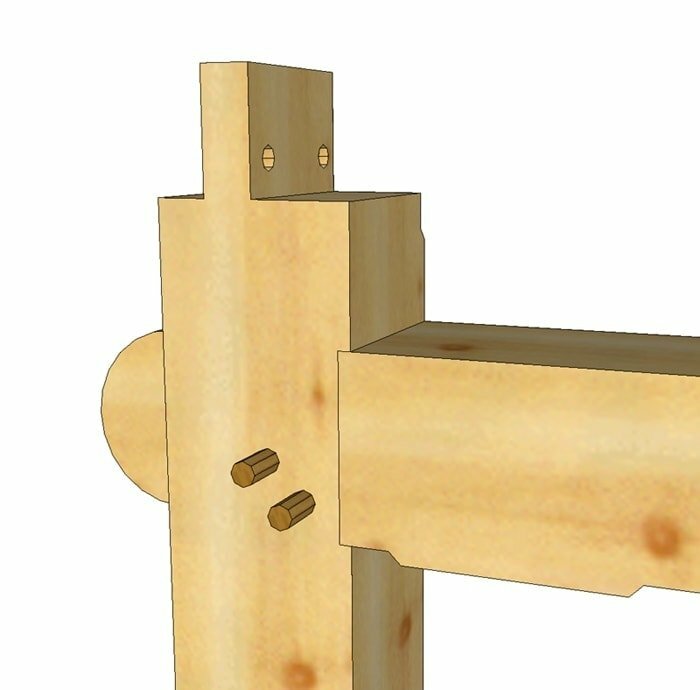 This joinery detail came from Jim Rogers but I am planning on a creating a video on how to drill holes straight…and you are correct there are some tools and trick to it. Thanks for the feedback, I will get working on it soon. The mortise is a standard through mortise. First you laid out the mortise on both sides of the post. And the housing on one side, the inside. After you laid out the mortise and housing with pencil you scribe the lines with a knife. 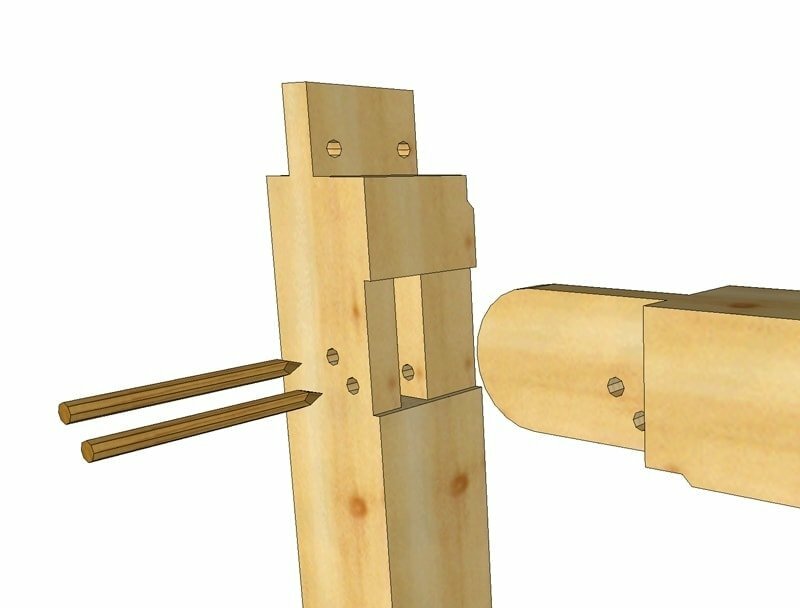 This cuts the fibers of the wood at the surface so that when you bore the holes out you don’t chip out the wood beyond the mortise or the housing. You bore the holes half way through from each side. I use a boring machine that holds the bit exactly 90° to the surface of the timber in two directions. Left to right and front to back. If your timber is true and square or what I mean is 90° faces to each other then there is no problem lining up the holes. If the timber is out of square then you may need to shim the base of the boring machine to compensate for the out of square timber. After the holes are bored you trim out the excess wood with a chisel, corner chisel and/or slick. When the mortise is done you then cut the housing. To cut the tenon, you’d layout the lines on the end of your timber. Then cut the offset side first. That is the side that is 2″ off the layout side. Then cut the tenon to thickness. After the tenon is done you cut it to size by removing the extra along the bottom back a little beyond the shoulder and detail it with a 45° cut. After the tenon is done you can then cut the curved end on it. If you go to my YouTube channel and what my three videos of the “Boss” double eagle boring machine, you’ll see me layout a mortise. Thanks for asking the question. And for more info ask another.